*This miniseries is continued from Plastron Cafe' #3. *Only “North by Down East” is a Ninja Turtles comic. *Page 1 (numbered 24) of this segment of “North by Down East” was colorized and reprinted in Casey Jones #1. Pages 2 through 8 (numbered 25 through 31) were colorized and reprinted in Casey Jones #2. 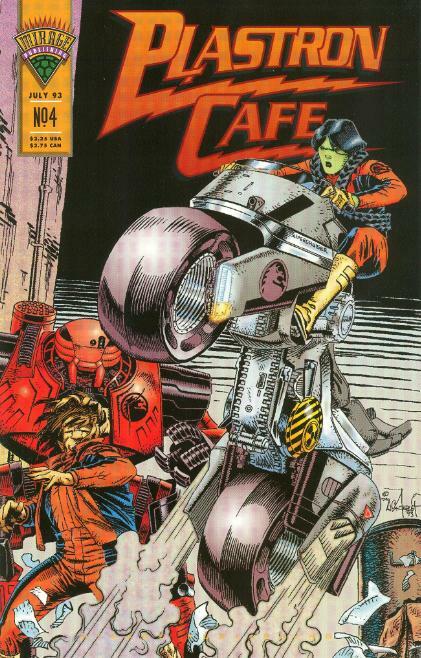 Due to the cancellation of Plastron Café, parts 5 and 6 (pages 32-47) of “North by Down East” were only published in Casey Jones #2.